As a landowner in Texas, you know the value of a reliable fence. Here at Ware Fencing, we have years of experience in all types of fence repair, fence replacement, and fence installation. 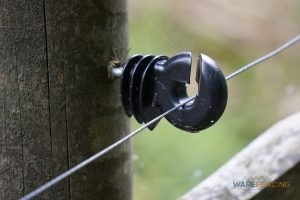 In recent years, electric fences have become more popular than traditional barbed wire in terms of livestock containment. If you’re interested in learning more about the ins and outs of electric fence installation in Crowley and Fort Worth, TX and the surrounding areas, give us a call at 817-948-4503! Our team has plenty of experience providing professional fencing to farms and ranches all over Texas, in addition to our residential and commercial services. We are glad to help you choose the ideal fence for your needs and budget. Many people believe that electric fences are an extreme or unnecessary form of containment, and are surprised that there are many benefits to this method of fencing. Did you know that electric fencing causes less injury to livestock than barbed wire, with the added benefit of greater durability? Barbed wire consistently cuts and gouges livestock, and is incapable of holding an animal back if it truly wants to pass through. Electric fencing works on a psychological level and teaches your livestock to stay away from the fence. Also, electric fences installation is also much easier and less dangerous than barbed wire fence installation. In fact, electric fences also offer more flexibility than barbed wire and are capable of being used in permanent, semi-permanent, or temporary situations. To make things even better, electric fences are much more affordable than you might think! There are plenty of benefits associated with electric fencing, and the list above only applies to keeping your livestock in! These fences are also particularly effective in keeping predators and trespassers out. If you’d like to receive a quote on our electric fence installation in Crowley and Fort Worth, TX today, give us a call at 817-948-4503 and speak with any of our experienced fencing contractors. We have years of experience, and we are fast and efficient with our installations. Invest in your property with a high-quality electric fence from Ware Fencing, and experience the difference for yourself! Updated on September 20, 2018 at 8:58 am by Ware Fencing.